Fortunately you can gradually phase your way out of a day job into a financially stable, full-time music career, so you can say “yes” to opportunities when they come up. Learn how to do this in this article about starting a career in music. Above all, remember that the music you put out is not just a demonstration of your songwriting talent, but also a display of your band’s overall professionalism - something record companies watch closely for. Invest the time into learning how to make the highest quality recordings possible, with whatever equipment/budget/skills you currently possess. Record companies will look for ‘proof’ of your work ethic in every interaction they have with you. It’s not enough for you to simply ‘talk’ about being passionate or how music is the only thing you want to do in life (this doesn't impress anyone). There also isn’t any ‘one’ thing that you must demonstrate to prove your work ethic - it’s something that the companies will get a general sense of by looking at your level of accomplishments in the other 21 items on this list. The lesson for you here is to become aware of the general importance of your work ethic and develop this capacity within yourself to the highest level possible. 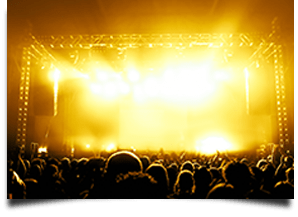 Learn more about how to get fans in your local area by reading this article about music promotion. You can turn the odds dramatically in your favor by getting music career mentoring to learn how to set yourself up for success in these avenues of the music business. Discover the exact steps to take to begin a successful career in music. by more people and get more fans. Are You Ready For A Music Career? to become a professional in music. There will never be a point when you are 100% happy and fulfilled with your musical skills. No matter how good of a musician you become, you will ALWAYS want to become ‘a little better’ than you are now. This desire to always become ‘a little better’ is a mirage that you can never catch up to - resulting in your entire life going by without your music career dreams being realized. Learn more about developing this quality within yourself by reading this article about building a music career. Working in the music business often involves putting yourself in many high-pressure situations. To maintain a successful music career for the long term, you will not only need to write/play/record music, but do so quickly and accurately in as little time as possible, tour for months on end and interact with a wide variety of people with conflicting personalities... all while working under strict deadlines with many thousands of dollars at stake. If you are not mentally prepared to function well under this kind of pressure, record companies WILL quickly discover this and will hesitate to invest their money into your music career. Now that you understand what record companies are looking for in you, start taking ACTION to develop the qualities that put you at the top of the list of musicians record companies want to work with. Follow the advice in the resources I provided throughout this article to learn more about how to do this. You can take an even greater shortcut towards becoming a successful professional musician by working with me directly in my music careers mentoring program. Become a successful professional musician fast by joining the best music business success training program.